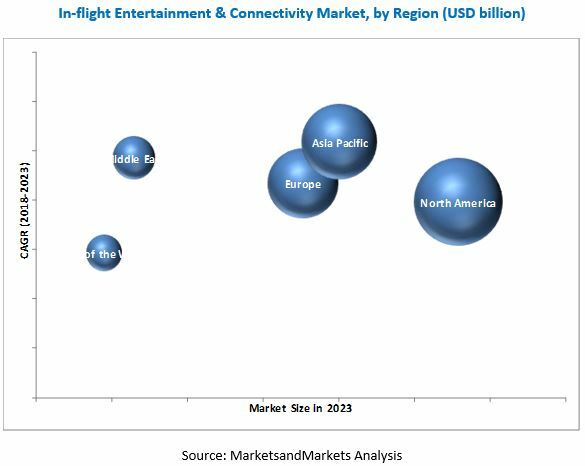 [183 Pages Report] The in-flight entertainment & connectivity market is projected to reach USD 7.65 billion by 2023, at a CAGR of 8.72% from 2018 to 2023. The base year considered for the study is 2017, and the forecast period is from 2018 to 2023. 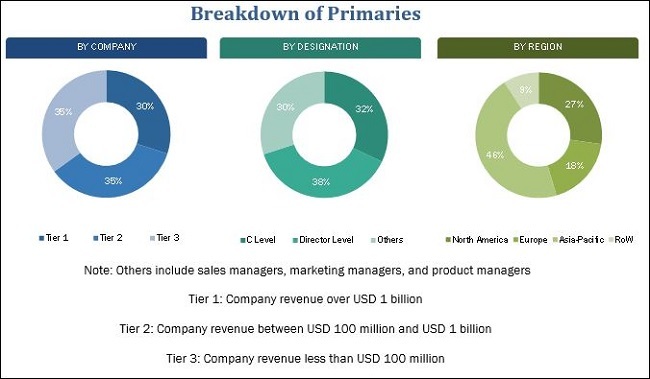 The report analyzes the in-flight entertainment & connectivity market on the basis of aircraft type (narrow-body aircraft, wide-body aircraft, very large aircraft, and business jets), end user (OEM and aftermarket), and product (IFE hardware, IFE connectivity, and IFE content). These segments and subsegments are mapped across major regions, namely, North America, Europe, Asia Pacific, the Middle East, and the Rest of the World (RoW). The report provides in-depth market intelligence regarding the market dynamics and major factors influencing the growth of the in-flight entertainment & connectivity market (drivers, restraints, opportunities, and industry-specific challenges), along with an analysis of micromarkets with respect to individual growth trends, prospects, and their contribution to the overall market. The report also covers competitive developments, such as long-term contracts, new product launches, collaborations & agreements, and research & development activities in the in-flight entertainment & connectivity market, in addition to business and corporate strategies adopted by key market players. This research study involved extensive use of secondary sources, directories, and databases, such as Hoovers, Bloomberg Businessweek, and Factiva, to identify and collect relevant information. Primary sources included industry experts from in-flight entertainment & connectivity market, as well as preferred suppliers, manufacturers, solution providers, technology developers, alliances, and organizations related to all segments of the industry’s value chain. All primary sources were interviewed to obtain and verify critical qualitative and quantitative information, as well as to assess prospects of the in-flight entertainment & connectivity market. The ecosystem of the in-flight entertainment & connectivity market comprises raw material suppliers, manufacturers, distributors, and end users. Some of the key market players operating in the in-flight entertainment & connectivity market include Panasonic Avionics (US), Thales Group (France), Rockwell Collins, Inc. (US), Gogo LLC (US), Honeywell International, Inc. (US), Zodiac Aerospace (France), and Global Eagle Entertainment (US), among others. These players have adopted strategies such as contracts, new product developments, collaborations, and agreements to strengthen their positions in the in-flight entertainment & connectivity market. The In-flight Entertainment & Connectivity (IFEC) market is projected to grow from USD 5.03 billion in 2018 to USD 7.65 billion by 2023, at a CAGR of 8.72% from 2018 to 2023. The need to enhance the passenger experience, technological developments, and an increase in aircraft deliveries are factors expected to drive the market. The market has been segmented based on fit, aircraft type, product, and region. Based on aircraft type, the IFEC market is segmented into narrow-body aircraft, wide-body aircraft, very large aircraft, and business jets. The narrow-body aircraft segment is expected to lead the IFEC market during the forecast period. The growth of the narrow-body aircraft segment can be attributed to an increase in narrow-body aircraft deliveries worldwide. Airlines are presently replacing the older fleet of narrow-body aircraft with the introduction of latest aircraft, such as the A320neo and the 737 Max. They are also focused on the procurement of the next-generation narrow-body aircraft to improve profitability. Based on product, the market is segmented into IFE hardware, IFE connectivity, and IFE content. The IFE hardware segment is projected to lead the IFEC market from 2018 to 2023. Several market players are developing portable equipment to accommodate more seats, thereby reducing the operating cost of aircraft. Additionally, hardware providers of IFEC systems are taking advantage of the connectivity option that offers content streaming solutions. The geographical analysis of the in-flight entertainment & connectivity market includes regions, such as North America, Europe, Asia Pacific, and Rest of the World. North America is estimated to lead the in-flight entertainment & connectivity market in 2018. The aviation industry is one of the most profitable industries in North America, with major aircraft manufacturers, such as Boeing (US), Bombardier (Canada), Lockheed Martin (US), Bell Helicopter (US), and Sikorsky Aircraft (US) in the region. The regulatory framework & certification and increase in the overall weight of the aircraft are factors restraining the growth of the in-flight entertainment & connectivity market. The recent developments section of the report includes information on new products developed and contracts undertaken by various companies between 2014 and 2018. Major players in the in-flight entertainment & connectivity market include Panasonic Avionics (US), Thales Group (France), Rockwell Collins, Inc. (US), Gogo LLC (US), Honeywell International, Inc. (US), Zodiac Aerospace (France), and Global Eagle Entertainment (US), among others.